VRLA batteries are commonly used in three-phase sources of UPS systems. Because of its weight and size, data centers need to have an enhanced load bearing structure. The performance characteristics of VRLA batteries will also be affected by temperature, thus increasing the load of the air conditioning system. VRLA batteries are not particularly durable and need to be replaced at regular intervals, which also results in an increase in operating costs. Because VRLA batteries are not economically viable alternatives, design engineers must tolerate their shortcomings. However, the situation of lithium batteries has changed in recent years. The first uninterrupted power supply system powered by lithium batteries was launched in 2016. Lithium batteries are now used in all major factories, and this direction has been recognized as the most promising choice. As of 2025, the lithium battery solution will account for 40% of the UPS market in the data center. When the capacity of lithium-cobalt batteries reaches several amperes, these UPS systems are equipped with rectangular lithium-manganese batteries.Its installation capacity is 60 amps, and has a longer service life and a variety of fault protection. Sometimes individual modules, even individual batteries, are responsible for monitoring important performance parameters, such as temperature, voltage and current. Sometimes the power cabinet or even the whole system can be responsible for the monitoring process. Monitoring must be implemented to fully control the charging and discharging process and avoid critical heating and irreversible chemical procedures. Lithium batteries also have higher energy density (Wh/kg) and higher output power density (W/kg). With energy storage capacity similar to lead-acid batteries and less than a third of the weight of lead-acid batteries, this advantage helps to reduce the total mass of the system to 60-80%. In recent years, due to space constraints and the need for more efficient operation, data centers have focused on increasing their power density. More efficient available space is one of the most important tasks of data center owners. The small size lithium battery can reduce the occupancy space in the uninterrupted power supply system to 50-80%. Such batteries have less charging time and better self-discharge rate, which can play an important role when frequent interruptions occur. When it is idle, the lithium battery loses about 1-2% of electricity per month. The most important advantage is its long service life. The life of lead-acid batteries is very short, only 3 to 6 years. On the other hand, lithium batteries can last for about 10 years. According to different chemistry, technology and temperature, the charging efficiency of lithium batteries can reach 5,000 life cycles without maintenance, while the average charging efficiency of lead-acid batteries is only 700 life cycles. The overall cost of ownership of lithium batteries is 10 years (the average life of UPS in data centers), compared with 39% less lead-acid batteries. Although this is an optimistic estimate, it can at least guarantee a savings of 10%. The only serious disadvantage of lithium batteries is that the initial investment is obviously higher. The more important purpose of this facility is to reduce the overall cost of ownership rather than short-term profits, even in this case the cumulative cost savings are considerable. In addition, the advantages of small batteries can make more efficient use of available space, while reliable monitoring system can also ensure better safety and stable performance. Lithium batteries can operate at higher temperatures than VRLA, without loss of capacity, and can reduce the load of cooling system. Of course, there are even single-phase UPS equipped with lithium batteries. Various application models start with the largest data center, followed by industrial applications, and end with small server rooms or even individual racks. The most important question that all customers will eventually ask themselves is: Is it the right time to upgrade UPS to lithium batteries? To answer this question, the first thing to consider is the availability of technical capacity. New batteries are not suitable for all UPS models, so major hardware and embedded software upgrades may be required. Even under the same nominal voltage, the characteristics of battery charging and discharging are different. In data centers, the life expectancy of a general UPS system is usually 10-15 years. Lead acid batteries can be used for 3-6 years, while lithium batteries can last for 10 years or even longer. In the initial stage of UPS system (less than 5 years), a large number of lead-acid batteries can be proved to be practical. However, after changing to lithium battery, it is very likely that the lithium battery can still be used at the end of the life of the UPS system. If your uninterruptible power supply system is near mid-life, the battery life may be longer, so in most cases replacing the battery is meaningless. At the end of its service life, you should consider replacing your entire UPS system with a new lithium battery solution. However, even for the old UPS system, the installation of expensive batteries is still very convenient. You should consider the declining price and the ratio of maintenance cost to replacement cost. Efficiency > 96% at 50%-75% rated load, and > 95% at 25% rated load; Input PF > 0.99,input THDi<3%. Output PF is 0.9 or 1, no need of power deration with load of leading or lagging PF. Full front access, UPS, failed part can be replaced shortly. without interrupting the normal operation of UPS. 6.6-inch extra large LCD that can display 12 language (Chinese ,English ,Russian, French ,Spanlish and so on). 7.Provide large LCD touch screen (optional). 8.Each UPS modules provide 4.5KW charge capacity. equivalent to 10 to 12A. 9.On-Line Double Conversion, fully isolating the influences of power grid pollution and power failure from utility power supply and diesel generator to load. 10. Advanced DSP full digital control technologies realize higher system stability, online capacity expansion and maintenance. 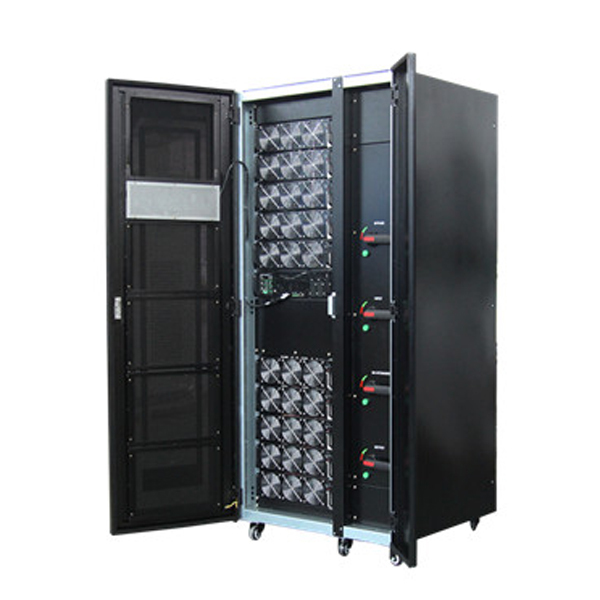 11.Advanced distributed active parallel technology realizes parallel operation of 4 UPS units and online capacity expansion without centralized bypass cabinet. 12.Digital load sharing technology features extra low cross current and extreme high system reliability in parallel operation. 13.Adaptive to severe power grid environment due to extra wide input voltage and frequency ranges. 14.Extra strong capability to withstand output overload and short circuit, ensuring the system stability and system safety at limit conditions. 15 Intelligent battery management maintains battery automatically to prolong the battery life. circuit boards and built-in dust filter.